Barbara and Douglas Fink are no strangers to lottery luck. 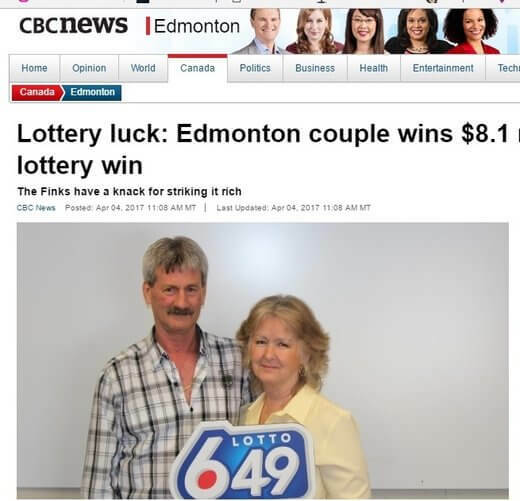 Douglas was one of four friends who split a $128,000 6/49 lotto win back in 1989, and the couple won another $100,000 in 2010 while playing together. But now it’s much bigger. Their third win is a 6/49 lotto jackpot worth $8.1 million! It was Barbara who found out they were winners in the Feb.22 draw when she checked the results through her phone. And she was shocked to see all her numbers on the screen. She had a hard time phoning her husband, who was at work, but was finally able to connect. The happy couple now says their priority is helping out their family. But they also plan to buy a new home, go on vacations and enjoy their winnings.